Left: The .94/34 K4MSU antenna: High atop the Price Doyle Fine Arts building on the MSU campus, at roughly 200 feet above average terrain. 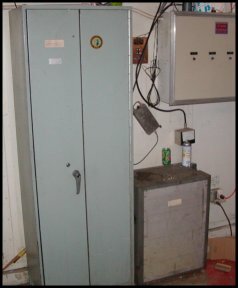 Right: The .94/34 repeater cabinet and (duplexer cabinet to its right). These reside in the elevator machine room known as the Price Doyle “Penthouse”. Here we enjoy the benefits e-Power back up. Left and right: The open .94/34 cabinet. Lots of goodies in here. Only Bill, KJ4W knows how this thing ticks. Maybe we can get an outline of the components in here from him one day. Below: The home brew .94/34 duplexers. Our APRS digi on 144.390 MHz and sporting the KPC-3+ gives us wide n-n capabilities. This was the temporary transceiver (the Kenwood from the Radio Lab). 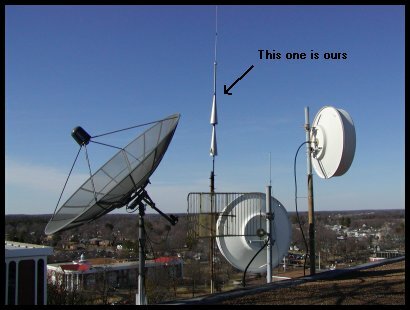 We now have a dedicated transceiver for this installation, which is in Allen Fowler’s (KD4JME) shop next to WKMS. Our old KO4ZE-1, the MURRAY Digi; a TAPR TNC-2 and Uniden commercial transceiver. This is off the air right now pending relocation to our new site atop Regents hall on the campus of MSU. The old 145.01 digi antenna on Price Doyle now being used for APRS on 144.390 MHz.